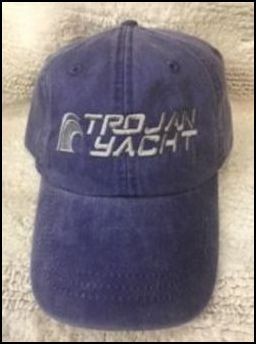 As Trojan's worldwide popularity grows; the Trojan line grows with it. 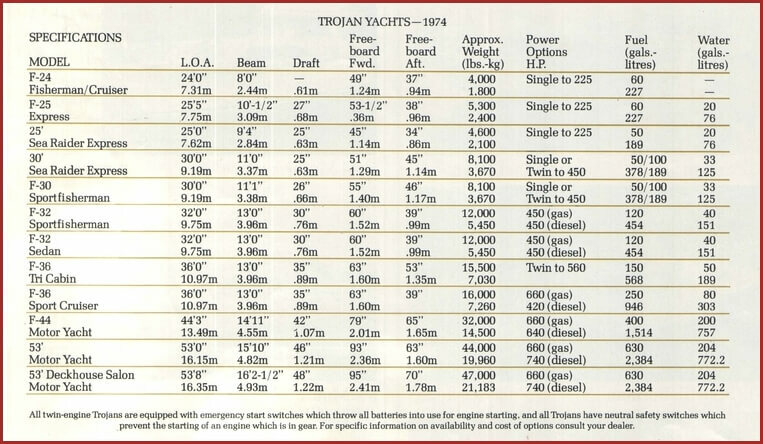 For 1974, Trojan offers an expanded array of Sportfishermen, Cruisers and Motor Yachts, from 24 to 53 feet. Each boat is a product of Trojan's unique design philosophy, to build boats that have what the consumer wants, not what the designers want. Trojan research showed that fishermen wanted a boat that wasn't overly large but still could be lived on comfortably for four or five days. Trojan's new 32' fiberglass Sportfisherman is that boat. It has a galley, dinette that feeds four, a head, and sleeping space for up to five. We also found that people wanted motor yachts with more privacy. Our new 53' Deckhouse Salon Motor Yacht and 44' Motor Yacht answer that need. Instead of having back-to-back guest and master staterooms, our 53' has bathrooms between the staterooms which act as a privacy buffer. Our 44' features big, completely private staterooms and fully private bathrooms. And both motor yachts offer optimum "livability" and convenience items. Last year, we introduced two boats that became overnight successes. The F-30 Fisherman ("the clean machine") and the super-roomy, fiberglass F-32 Sedan. Both continue to be an important part of Trojan's fleet. Also included in the 1974 line is the fiberglass F-24 Fisherman, a trailerable boat which sleeps two. The F-25, a four-sleeper fiberglass cruiser that's the roomiest 25-footer we ever built. The 25' and 30' Sea Raiders, both outstanding values. The F-36 Tri-Cabin, a fiberglass beauty with staterooms on either end, separating you and your guests. And the fiberglass F-36 Sport Fisherman, whose interior space and fishing capability have made her a classic from Hawaii to the Mediterranean. 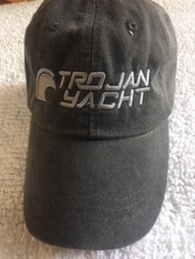 Most important is that all Trojan boats reflect what we call 'the Trojan edge' They have Trojan's famous design and durability features at a price as competitive as anything on the market. 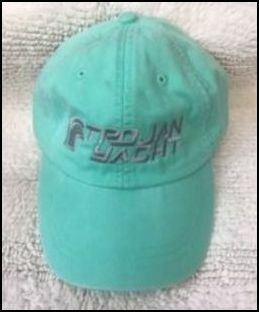 Check the Yellow Pages for your nearest Trojan dealer or write Trojan Yacht. Trojan makes two Sea Raiders. 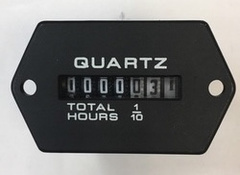 In 25 and 30 feet. The Sea Raiders are our popular-priced line. They are beautiful family cruisers with hulls of fiberglass and decks and cockpit of polished teak. The 25' Raider sleeps four, has a complete galley, head, dinette, and handsome carpeting, draperies, and cushions. The 30' Raider sleeps six, and has galley, head, dinette, and furnishings. You can even get it with a flybridge. And with twin engines. 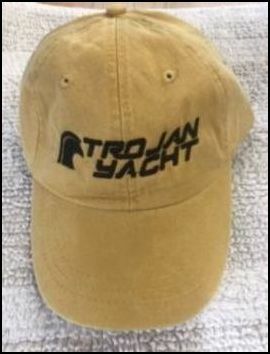 If you look at boats in terms of beauty, durability, and performance per dollar, you'll find you can't match the Trojan Sea Raiders. This year, Trojan introduces a 53' Deckhouse Salon Motor Yacht and a 44' Motor Yacht. Our 53' features oversize staterooms (with a kingsize bed in the master stateroom). Private bathrooms with individual showers. A dinette that seats from six - room). Private bathrooms with individual showers. A dinette that seats from six to eight. A flybridge that's a complete social deck. A big deckhouse salon for entertaining. And a small laundry room with washer and dryer. The new all-fiberglass 44' has a roomy master stateroom with private tiled bathroom. A fully equipped and beautifully appointed galley and lounge. A large guest cabin, forward, connecting with a private bathroom. A tasteful and roomy salon. And, top-side, a well laid-out bridge. The F-Series is our line of all-fiberglass cruisers. They're not remakes of old wood designs. 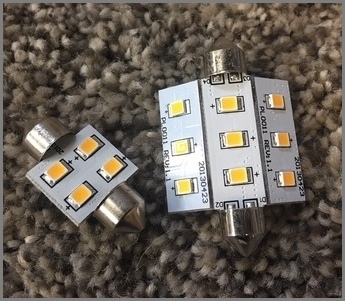 They're specifically engineered to take advantage of the unique properties of fiberglass. This means better performance, better looks, and more room below. More room for luxury living. L-shaped galleys or lounges, lots of drawers, lockers and stowage. Full-sized berths and showers, even in our smaller cruisers. The fiberglass materials, cloth, mat and resin are the finest that can be bought. The gel coats are perfectly smooth, close to flawless. And they need a minimum amount of upkeep. To call these boats seakindly would be a gross understatement.